I spend a lot of time talking to people about social media--how it can be a model for real-life content venue interactions and how it can connect museums and cultural institutions to users in new ways. But inevitably (and quite appropriately), someone will say, "all of this is very interesting. But my organization is functioning just fine without it. Is there some reason that I really need to pay attention to social media?" This is an honest and valid question. And only recently have I concluded that my answer is yes--not that your organization needs to do anything in social media yet, but that you should pay attention. Here's why. It has to do with reach. In the 2000s, it was important to have a website so that people could "find you" on the Web via search engines like Google. But the Web is changing into a socially contextualized information environment, and as that change happens, it becomes more important that people can "find you" via their personal social networks. Here's a longer explanation, and here's the Nielsen research report that motivated this post. The way we use the Web is fundamentally changing. Eleven years ago, Google launched and vastly improved search capabilities on the Web. Before Google, lots of people used the internet via services like AOL, but we didn't use the Web a lot. We sent emails and IMs. We engaged in chat rooms and consumed content selected by AOL or Prodigy or Yahoo. Now, of course, Google is a huge part of our lives. We talk about "googling" things in all kinds of contexts. For many people (including me), Google serves as homepage. My portal to the Web is through search. This means that I think of "entering" the Web as a hunt for information. Google has conditioned us to think of the Web as the outcome of atomized search for information. I need to know something, so I look it up. I find the page. I find the answer. The end. This is the reason that many museums and cultural organizations decided they needed websites in the late 1990s and early 2000s. We recognized that people were increasingly turning to the Web as a source of information--for content knowledge but also for trip planning. I believe that the primary reason most museums started their websites is about planning visits. Marketing departments realized that a large percentage of people were using online search engines to find interesting things to do, and they wanted to be there. Now, things are changing again. Whereas the Web of the 2000s was dominated by search, we are entering a time when more and more people are using social media as their gateway to the Web. Ask a college student what her homepage is, and you are likely to see Facebook, not Google, pop up on her screen. The worldwide market reach of social networks and other "member community sites" (as Nielsen research deems them) is growing rapidly, and it seems likely that Facebook and other social networking sites will continue to attract older, more mainstream audiences. This means that more and more people are "entering" the Web via social context. Last week, Susie Wilkening wrote a blog post expressing that Facebook has replaced her newspaper as the go-to place for relevant news in her life. It's not hard to imagine a near future where Facebook (and sites like it) also replace a lot of the ways we use atomized search. This already happens for me with professional research. When I'm looking for a resource on something, my first stop is Twitter, where I can send my research question to my professional network. Then I use Google to track down the references they mention. 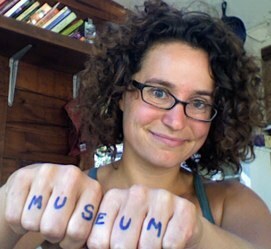 People often ask me how I find out about interesting projects going on at different museums. I'm not constantly googling "visitor co-created exhibits" and searching blind. I find out about these things in my social networks--via blogs, professional communities, Twitter, and socially-selected content feeds, which contextualize and direct me towards information of interest. This isn't just a professional shift. For people who are deeply immersed in social media, social networks are already a much heavier influence on personal choices--where to visit, what concert to attend--than traditional advertising. Which means that your organization's website--a brochure out in the wilderness of the Web--is only going to remain relevant and useful as a marketing piece if it is being referenced in the social context of your users' lives. The time is coming when atomized search will take a back seat to socially networked information sources, and that is going to change what it means to have a presence on the Web. Does this mean your organization needs a social media presence today? No. Think back to how and when you decided that you needed a website at all. What was that decision based on? Did you lose potential opportunities because you came late to the Web, or did you waste resources by investing too early in an untested environment? You have time to make the same kind of decisions with regard to social media. Some institutions already feel the imperative, whereas others are years away. Social media is already changing the way people interact with the Web. Don't say I didn't warn you. Very well said, Nina, especially the second-to-last paragraph. Thanks, Will. Maybe I should have put that second-to-last paragraph higher! And thanks for the link.. maybe more people should write "Why Should We Care" manifestos about all sorts of things. Great post Nina! Especially as we are having our kickoff meeting to redesign our Web site tonight (thanks to a Taproot foundation service grant) and one of my goals is to find a way to get our web site "beyond brochure-ware". It will continue to be a resource for "plan your visit" but I want it to be a place where we can link visitor's expressions about us into it (their blog posts about their visits, their flickr pics and youtube videos etc). Basically I want to "close the loop" - so that you don't just visit our site before your first visit, but that you come back to see how your online expression of your visit is reflected in the "official" museum site too. We are using social media, after a long period of "wait and see-ism" for even a simpler reason. Our audience is using it to plan what they do on the upcoming weekend. They are asking their friends/networks what is good, what do you do with an eight year old girl and her 10 year old brother. We became more aware of that ecology through using facebook etc, but also through the google subscribed search function, which gives you an inkling of how often the institution is mentioned in blogs, etc. Its clear that the number rises when we have events that are popular, etc. Like many museums, for the past decade or more we have put a lot of effort into creating seasons during which there is something significant to market. This has driven much of our traveling exhibition rental policy, and shaped our programming. So, in the summer, we have Magic, the traveling exhibition, in the winter we have Crystal Winter, our in-house themed event. Over the past few months we had a lovely little exhibition called Airplay that we marketed in local media and radio spots. At a recent discussion, as we were trying to come up with a "theme" for an upcoming season, I wondered aloud whether a social media marketing strategy might release from another round of faux seasonal programming (jump into spring! funtastic fall!). If we could market more locally, in the temporal sense, we could follow peoples decision making habits more precisely. Practically speaking, no family decides to come to the Hall 2 months before their visit, they all decide on thursday for the coming sunday. And we could market what we are actually doing "Make a trebuchet and launch your brother!" rather than having "funtastic fall!" We'll see if the marketing folks agree, but it would be great if it worked. Really nice piece, sorta baselines the whole discussion. 2. "atomized search will take a back seat to socially networked information sources" Really? If I want to know what the Spy Museum's hours are this weekend I'm going to ask my friends, hoping that their memory and responsiveness are better/faster than finding the museum's Web site? That may seem like the counter example that proves the rule, but I would argue that many types of searches are for information that are most effectively done via general searching - maybe eventually with tools better than Google, but searching nonetheless. You say yourself that you use Google to follow up on leads generated from your social network. That indicates that there's a new complimentary tool (your social network access tools) that makes the existing tool of Google even more useful to you, not that it's being replaced. At the very least I think you'll have an unnecessarily hard time convincing people of the replacement argument. Rather, why not limit the point to what Eric is saying? That social media has already for many people, and will for most people, replace search engines as a way to answer the open-ended question "What shall I do this weekend?" That, I think, is more defensible. If your institutions comes up as an answer there, then search is even more likely to be used to answer some of the "how" & "when" or "which of these good three suggestions will I follow up on - i.e. convince me" type questions. And that's what usually happens with technology - a new tool comes along that is better for a subset or an overlapping set of situations, and is used for that, the old tool is still best for a set of tasks. Movies haven't completely replaced books, or I would argue even made them "take a back seat". 3. Google didn't replace AOL. It was just a modest incremental advancement over very similar tools - Alta Vista, Lycos, Northern Lights, Yahoo! 's search. Enough of one that it became dominant over 10 years, but not at all a paradigm shift in terms of search (for advertising, that's a different story). If your central argument is a metaphor, then I think that will only be highly successful if the metaphor is with something that is true. 4. The reason that I replaced the New York Times as my homepage with Google at some point - and this may be the case for you too, Nina - was not search. I have a Google search box built into my browser, as do most people. It was RSS. I.e. the "feed" of titles from blogs and news sources and widgets that fill up one's Google home page. That's one part of what switching to Facebook is replacing. One could just as easily conclude with your reasoning that blogs will now take second fiddle to Twitter feeds. Which I think would again be mixing metaphors. Blogs are content; how they're accessed or "found" may be changing in some cases via social media. But RSS won't be totally replaced by Twitter or Facebook feeds any more than search will. It will just be used only for what it's really good for. a) a new set of content is being added to and made accessible through the Web and the Internet. That is grass-roots content from individuals; content each of us generates from our lives. b) that content is being published in a way that saves and makes use of its social content. c) this has enabled tools that are already doing a better job for many people of things that other tools, like search and RSS, have never done well at - like answering very open-ended or highly personalized questions. 6. I don't think that whether institutions "need" to have a social media presence, whatever that means, is the right question. What is "need"? That sounds literally like "Would we go out of business if we didn't do this?" I think the better question is one of opportunity "Is having a social media presence a particularly inexpensive and low risk way to boost attendance or better meet some other goal core to our mission?" If the answer is yes, then it's probably worth doing. If not, it probably isn't. At some point having a Web site crossed that threshold. I think you could probably make a very good argument that the threshold has already been crossed for social media for most institutions. With my line of thinking, I'd actually argue a fully different conclusion than you reach. I would not say: social media will overtake search at some point, but it isn't at a relevant "action point" for most institutions today. I'd argue that social media is totally different than search, performing a few relevant functions much better, and that where it is today in regards to those functions is important for museums and HAS just reached a time of positive and low-risk ROI for museums. You could go on to argue that something more like "need" may approach in the future, but that would require making the argument that eventually almost everyone coming to your institution will start their time-spent decisions with input from social media tools. That may be true, but I don't see you making that point explicitly. If you want to use an analogy of moving from AOL to the Web or the Web gaining sufficient popularity that museums "needed" Web sites, that could be useful. But I wouldn't muddy the waters with saying that what made that transition true is now being replaced. That may be true in smaller ways, but it isn't the point. The point is - A) if you want more visitors today, do the right simple social media outreach and B) someday in the near future (2-3 years?) you'll have to do that just to keep the same level of visitors that you already have. In light of B you might as well start going on A today! Nina, I think your points about museums looking at what's happening in the social media space rather than just jumping in are worth considering. However, I also believe that this shouldn't obfuscate the need for institutions to start experimenting in these spaces, see what works for them (and learn from what doesn't as per the mw2009 unconference session notes from Mia that I was reading) and then determine their social media strategy. We've been actively doing this at the Australian Museum and what it has managed to do is actually bring the staff along with the changes. We are all learning together about how the social web can best be used to engage with our many and varied audiences. We are blogging our progress here for all to see. The web *is* about search. I'm always reminded of interviewing 14 year old boys in our new dinosaur exhibition who were tasked to develop and answer their own sets of questions using the exhibition. When I asked them how they were going, they said they were having a great time being with their friends, seeing real stuff and will "just Google their answers when they get home". They (and I suspect most people) aren't terribly concerned about where they get their information, as long as they get it from somewhere. In the future I truly believe this will be via their social networks, if not already. In response to Sibley, my Australian research has found that people who visit museums are using the tools of 2-way communication at (statistically) significantly higher levels than those who don't. This research has been reported here. This suggests to me that museums who ignore the social web and focus solely on their own websites do so at their peril. First off "obfuscate" really? You went there? obfuscate!? I am floored. As to social media: Museums have snack bars. Museums have comfortable chairs, and some even have quiet places for mom's with young babies. They have large text panels you can pick up at the desk if you can't see, and adio tours if you are hearing impared. They bring in poor kids for free because poor kids don't always get to go to places of beauty. They generally are clean, special places, sometimes church like sometimes disney but for the most part they try to appeal to the senses. All of these things add VALUE to the institution intself and the experience had by the visitor. Web sites when done correctly add value. When the telephone was invented, it added value to bussinesses and indivduals everywhere. Thanks for writhing this. I cant say much more as I much rush to retweet this article. I agree with the idea raised that if museums are to get involved in social media they should strive to do it well, and not do it just for the sake of doing it. Listening and starting to think about participation seem to be good advice for this stage in the game. I enjoy having a museum be part of my social network, but when I start getting weekly facebook notices of events at the museum (which is not in the town I live in) it can become a little overwhelming. I fear that museum based social media not done thoughtfully or for the right reasons could end up generating proverbial "garbage out" experiences. But "paying attention" seems to me like a reasonable goal. I think this is a very exciting juncture for technology in museums because we are in a phase of pipe dreams-- a shining panoply of social technology is just waiting to be wielded for whatever we can dream up. It's a time for experimentation, and it's fun. That said, I think there is a palpable sense of that panic you described which beset many museums in the late 90's when everyone was at pains to get websites off the ground. Nobody wants to be last to the party, and often in that rush the technology itself becomes the object of desire, rather than the media through which we magnify, disseminate and enrich our offerings. Social technologies do not operate themselves, and they are only as ingenious as the people that design and deploy them. I admit, though, that I worry about the digital divide. While these technologies enfold and entrain more and more people, the 'revolution,' as it were, is contingent upon a certain level of access, and that of course is dictated by everything from wealth, to leisure time, socio-political stability and so forth. One of the best potentialities of these technologies, in my opinion, is to reach into the lives and situations of people in dire circumstances-- bringing them what they need through technology, be that community, education, problem solving, collaboration, or just a voice. I want these new networks to reach into the darkest and and most needful places, but because of the financial constraints of the actual hard technology required, and reticence among the uninitiated this will be difficult. For that reason I am a huge fan of no-tech programming that mimics the advantages of web 2.0 technology: connectivity, rating, collaborative adding and editing of content. The revolution, in order to be a revolution proper, must not be only for those with a Mac Book Pro. Great post there and something which I totally believe and subscribe in. Museums and cultural institutions need to move from being merely about collections to connections, and digital networks are the easiest ways to build relationships with a new generation. I agree that social media is making an impact and can't be ignored as a way for reaching people. However, the research reports from the PEW Internet and American Life Study don't support the fact that social media is eclipsing search. In fact, 5 of 10 internet users use search daily (second only to e-mail 6 out of 10). Only 1.3 out of 10 use a social networking site on a daily basis. Plus, search usage is still on the rise. I think the question PEW is asking is will search eclipse e-mail and the #1 use of the internet? This isn't stopping me from thinking about how to use social media, but it does cut through some of the social media hype. Facebook and Firefox are too.